It’s that time again… It’s MDA Shamrocks season! For 36 years, retail partners nationwide have sold iconic paper shamrocks to help kids and adults living with muscular dystrophy, ALS and related life-threatening diseases live longer and grow stronger. Over the decades, generous supporters have given more than $315 million through MDA Shamrocks; those funds have gone toward cutting-edge research and comprehensive multidisciplinary care and have created unforgettable MDA Summer Camp experiences and everyday support for families in hometowns across America. Until the end of March, you can purchase shamrocks for just $1, $5 or more at more than 20,000 retail locations in the U.S. Check out our Shamrocks finder to locate a participating retailer near you. Support MDA Shamrocks with a Facebook profile frame. 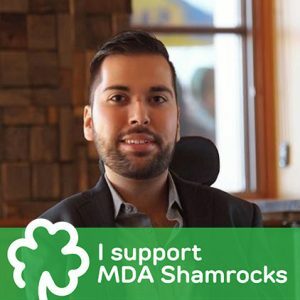 You can also donate any amount online and inspire your friends to get involved by changing your Facebook profile frame to support MDA Shamrocks all season long. Just visit https://www.facebook.com/profilepicframes and Facebook will automatically help you deck your profile out in shamrock green. And at the office, you and your team can join in on Green Day for MDA on March 16, when we’ll all don green in solidarity and support for individuals and families living with muscular dystrophy, ALS and related life-threatening muscle diseases. Together, we can make an impact, one Shamrock at a time. Many thanks to our generous top retail partners!